I haven’t done any long runs this week, mostly short for whatever reason my calves haven’t been up to them. No amount of foam rolling or stretching seems to help. But for me some running is better than no running at all and what I wont do is let myself do less the a 5K no matter how much my mind is yelling at me to stop. The past week the Circus has been in town and decided that the best place to erect their tents was along my normal running route. I smelled them before I saw them; you see at the 1.5 mile mark into my run I’m downwind from the circus so end up running into what seems like a thick vapor of elephant, other animal, and very possibly clown poo for the next ½ mile. 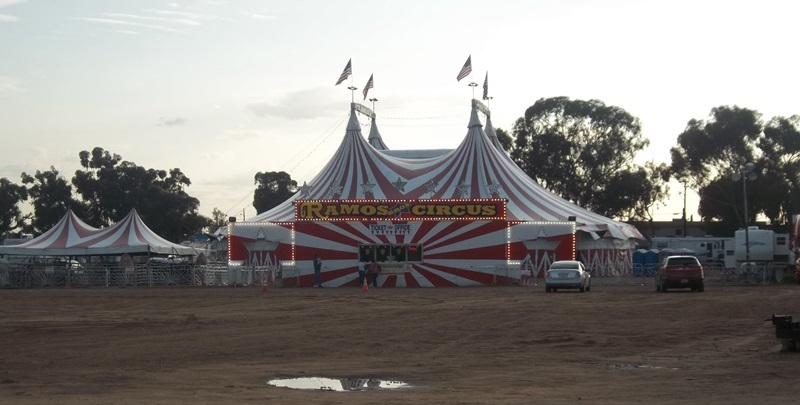 It is quite a training enhancer though, as I find that I tend to run faster in direct relation to the thickness of the vapor entering my lungs as I run in the direction of the circus. This is not because I am absorbing energy rich nutrients, no; it’s because of the need to get past the circus before I lose consciousness from lack of oxygen or over exposer to poo spores. There was one day that I didn’t suffer from poo inhalation, which was yesterday. Yesterday’s 5K run felt like a 13K. It rained mid-morning and by the time I got to my run at 6PM the humidity was super-high and to make things worse there was no breeze at all. Where this lack of air movement made my approach to the circus poo free, I felt like I was back in the Philippines running. By mile 2 every part of me wanted to stop running, at mile 3 my brain was trying to convince my body it was okay to walk because I already did three miles and it was just not logical to run uphill that last half mile. But, my body won out and my brain relented; only to complain again once I got to the end of my run. What were you doing, trying to kill me?… stubborn body… YOU NEVER LISTEN TO ME. This entry was posted in Running and tagged 5K, caca, Curcus, do-do, POO, poopoo, Ramos Circus, run, running. Bookmark the permalink. 19 Responses to Running: Ew! Elephant Poo. Well, at leadt this weather won’t last. The rain has been great, though. Clown poo; nice. Probably multicoloured. Oh man. large animal poop is the worst. I live about 1 mile from a zoo and somehow I never smell poop. I don’t know how that’s possible. Same story here; grew up near a cattle ranch and never smelt it; everyone who visited did. Hope your calves are ok… there’s no shame in taking it easy for a week or two if they aren’t. I”ve learned the hard way that when injury strikes, it’s usually best to cut the losses early. Running through the pain for me has resulted in worsened injuries and more time off. Haha, “overexposure to poo spores.” I fear I may have this in a house with five males! LOL, At this house Ustinky is what I say to my wife when the poo spore are airborne. Bill, you haven’t been posting. Are you okay? Sure do! Hope it is “good” busy and not bad stuff. And, hope you’re running! I bet! Yes, been a very full schedule here, too. But, gotta love San Diego summers! I do love it; just which this humidity would break. It was so much worse in New England when we lived there. This isn’t too bad in comparison. If we were runners it would be awful!